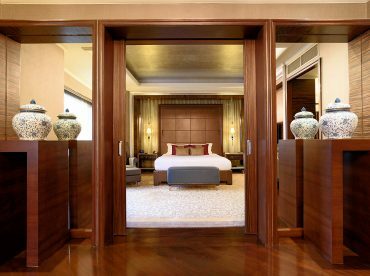 Pullman Bangkok Grande Sukhumvit’s Deluxe Suites offer a prestigious corner suite measuring 60 sq m . A separate living room, elegantly furnished, with a state-of-the-art working station. Work and leisure are a pleasure in the 14 Deluxe Suites. Guests enjoy exclusive access to the Pullman Bangkok Grande Sukhumvit Executive Club Lounge on the 24th floor – and all the privileges that go with it. Enjoy a complimentary breakfast, afternoon tea and evening cocktails. Or simply get away from it all with a soft drink, coffee or tea. Any time, from 6am to 11pm. And because Pullman Bangkok Grande Sukhumvit values your time, private check-in and check-out are available.